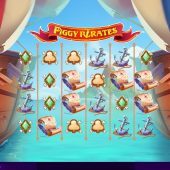 Piggy Pirates slot is evidence of Red Tiger taking our porcine friends and making them look even more childish than Microgaming did with their Piggy Fortunes effort - even Netent with Piggy Riches managed to do the theme without resorting to cartoon imagery. Nevertheless, we're stuck with the rather ridiculous appearance of the game which features transparent reels sat over the sea between two pirate ships and along with the standard Red Tiger springy sound as we start a spin, we have some jaunty seafaring tune playing before they stop. Will our bankroll become the pirate's plunder though, or can we save our bacon here? The grid consists of 5 reels of 4 rows each with 40 paylines and we can play for as little as 20 coins. Symbols are stacked as they usually our with this developer's games and before we see if there are any interesting random features, let's see the 5-of-a-kind pays. There are Wild Coins which you don't even see in the base game which pay 50x bet, Treasure Chests 25x, Coin Sacks 15x, Bottles 12.5x, Maps 8x and Anchor 4x. The four card suits all pay 1.5x for a full line of 5. Oh yes, I said it's now that we'll discuss the random in-play features - that won't take long as there aren't any. 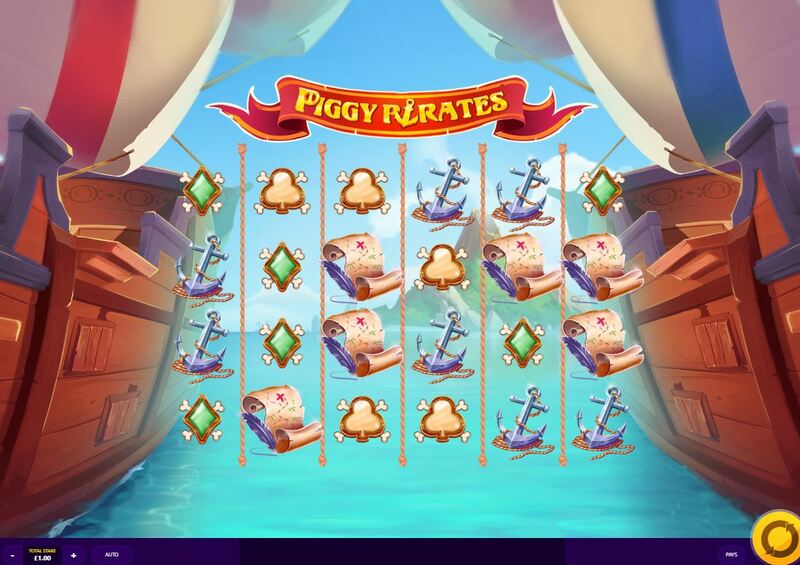 We need the 3 different Piggy Pirate characters to trigger unlimited free spins here but you don't usually trigger them in the conventional way. In a vain attempt to make the stupid slot look more involving and interesting, when one or two of them appear in view a silly cartoon-like bit of music starts and each spin the Pig(s) will move one reel left or right (depending on which side of the grid they landed on) and then they drop off the end into the water with some silly sound effects if the third one doesn't appear first. Unfortunately this can go on and on as if you get 2 and one drops off, another can land next spin so the whole palaver can continue for 10 or more spins without the third one landing to start the blooming bonus. Just hope the game spares you this nonsense and drops all 3 in in one go. If you do eventually get the 3 Piggy Pirates in view you get unlimited free games. The 3 Piggy Pirates turn into piggy banks and run about under the reels, collecting any Wild coins that can now appear on the grid. Eventually a Wolf will land on reel 5, throw a bomb at them and they'll explode throwing the collected Wild coins onto the grid for one final spin. If you collected all 20 Wild Coins you will get the game's maximum pay of 2000x bet.